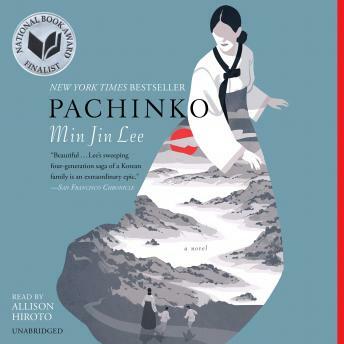 A New York Times Top Ten Book of the Year and National Book Award finalist, Pachinko is an 'extraordinary epic' of four generations of a poor Korean immigrant family as they fight to control their destiny in 20th-century Japan (San Francisco Chronicle). I didn't think I would like this book. I love historical fiction but wasn't very interested in the Japanese/Korean ideals. As the story went along I feel in love with the characters and my heart ached for them and the issues that surrounded them. I learned much more than I thought I would about their lives and views. I became totally hooked on the book and couldn't wait to listen to more each day. Other reviewers mentioned about there were too many characters with different story lines in the second half of the book but those background and feelings lead you to understand that other characters could have the same feelings and tendencies whether verbalized or not. When one character is expected to act a certain way and then another one follows through with those same feelings without them being expressed it totally takes the reader off guard. I was listening while weeding in the flower garden one day and sat up and yelled "NOOOO!" My sweet dog came running to me to comfort me and I sat there stunned for a few minutes. How talented an author is when they manage to hook the reader and evoke such feelings. ALL of the characters and their story lines have meaning in this book. Don't rush through so fast that you miss the hidden meanings. The only thing I didn't like about the ending .... was that it was over! I simply didn't want this book to end. I had goosebumps when I listened to the last several words. Well worth the read and the journey!!! I love historical fiction and learning about eastern cultures but this isn't a novel I would have normally picked up. It's length and density might be the main reasons. However, I really enjoyed this novel. It's an epic family saga that will have you invested into every character. It's a beautifully written, atmospheric, and poignant story. You could feel the love between the family members and that they try to make the best out of their situation. It's a story of family and immigration while the country is in hardship and war. I enjoyed the perspective of both the Korean and Japanese cultures. There's so much heartbreak and sad truths throughout the novel, but they are written so beautifully. Didn't care for the narrator as it was difficult to differentiate different characters. I really enjoyed this book and the narrator was fantastic! Such a wonderful listen! Captivating yet relaxing. Would highly recommend. I enjoyed the story of this family and following their story from generation to generation. It was very interesting to learn about the Korean culture and challenges during the 20th century and the challenges of the Koreans in Japan. I loved the first half of the story as it developed the characters and described the culture and their challenges. As the story progressed, i felt too many characters were introduced and some did not seem necessary to the story. Enjoyed this book. Narration good. The ending started to seem a little more rushed, with a tad less detail than the beginning, still a strong story worth listening (reading).